Customers buy these products with the Securi-T Stoma Paste, 2 oz. The SUR-FIT Natura ostomy system is a comprehensive product line with our latest skin barrier technologies. The plastic coupling ring allows the pouch and skin barrier to snap together for audible security. Durahesive® skin barriers are designed for people whose stoma output is mostly liquid. Unlike other skin barriers that can breakdown around liquid output, Durahesive® skin barriers swell up to better protect the stoma and peristomal skin. Convex is good for people with a recessed or flat stoma. Moldable allows for improved skin protection over traditional barriers. I love the ability to mold this into shape I need. 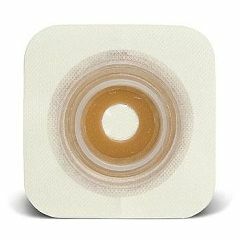 This convatec skin barrier works the best for my ileostomy. I tried a few other brands, both one-piece and two-piece systems, and this has been the best! I probably have higher than normal output and it's usually pretty liquid-y...if that's a word =) Other brands of tried have lasted 3 or 4 days before I'd have to change my barrier. Maybe 5 if I was lucky. These ones consistently last a week. They're a little more expensive, but they actually save me money because they last twice as long as other barriers I've used. They're comfortable and feel secure while I wear them. I don't feel like I have to take extra care all the time to extend it's wear. I did wear it in the bath once to test out it's durability and it did awesome! Being fully submerged in water didn't seem to affect it much at all. I would definitely recommend this product to anyone. I notice the wafer only goes up to 56mm my pouches are 57mm. will they snap together?